Musical Advisor: M. Clément Morin, P.S.S. Sources: "Codex Calixtinus", Biblioteca de la Catedral de Santiago de Compostela. McGill Records Natural SoundTM CDs are recorded using special microphone techniques developed by researchers in the Graduate Program in Sound Recording at McGill University's Faculty of Music. These techniques encode spatial information from the sound field directly into Dolby Surround TM signals without the electronic encoder and ensure the highest possible audio fidelity without phase shifts, band-limiting, added noise and distortion. The stereo reproduction of this recording results in an impression of natural and spacious sound quality. Reproduction with Dolby SurroundTM and compatible surround sound systems provides an spatial image, superior spatial definition and clarity of sound. This recording is fully stereo and mono compatible. Recording Stereo and Mono Compatible. In the present recording we have attempted to reconstruct the Mass which mid-twelfth century pilgrims to Santiago de Compostela might have heard had they entered the magnificent Romanesque basilica dedicated to St. James the Elder, apostle of Christ and patron saint of Galicia, the province in which Santiago was located. Together with the pious faithful from many lands they would have gathered on July 25th, the feast day of St. James, to praise in word and song that disciple who, according to tradition, had brought the Gospel to the Iberian peninsula, fulfilling Christ's commission to preach the Word to the "ends of the earth" (Acts 1:8). Santiago lies on the northwesternmost tip of the Iberian peninsula, further west than both England and France, and for a medieval pilgrim, truly the western "end" of the known world. The Mass provides a narrative of the life and death of James and draws upon both Scriptural and Patristic sources to authenticate the cult, for which the medieval pious had journeyed no far. There are frequent references to Christ calling James and John, his brother to be his disciples: these citations derive from Matthew 4:21-22 and Mark 3:17. The Epistle, which due to time constraints cannot be given in its entirety here, narrates the martyrdom of James at the hands of King Herod Agrippa I in A.D. 44 in Jerusalem as recounted In Acts 12: 1-23. James is beheaded by Herod, and thereby gains entry into eternal glory, but Herod dies a miserable death al the hands of an angel of the Lord, eaten by worms and full of putrefaction. A number of items in the Mass allude to James' presence in the Transfiguration (Matthew 17:1-8 and Luke 9: 28-36), a reference which showed the especially high esteem in which Christ held James, because James was but one of three disciples, in addition to John and Peter, who witnesse that event. Church Fathers who attested the validity of James as apostle of Galicia, are also cited: Clemens of Alexandria, Eusebius of Cesarea, Fulbert of Chartres, St. Fortunatus, and Pope Calixitus II (papacy 1130-1143) are quoted and acknowledged in person in the medieval source which transmits the Mass. 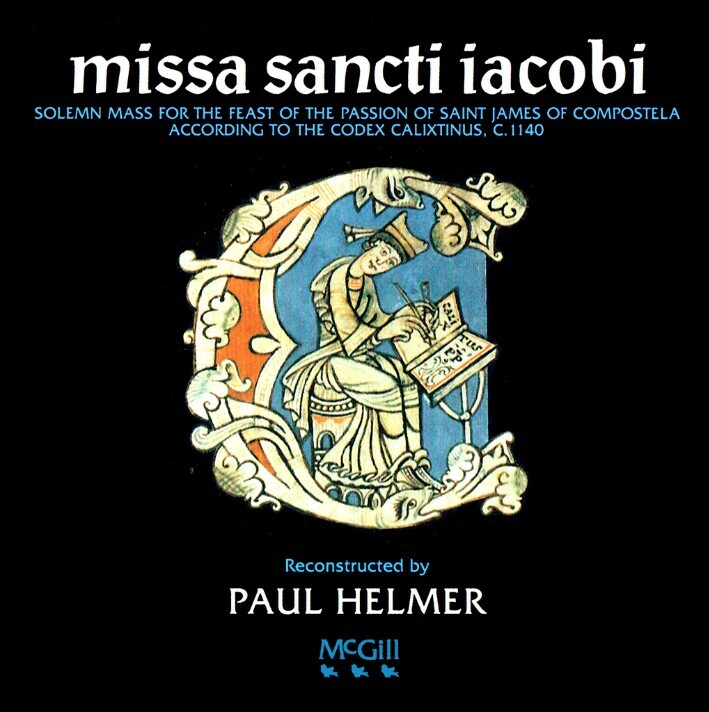 The Mass of St. James provides a rare insight into the many styles used in the composition of twelfth-century Iberian services from the simplest reciting tones (in the Gospel) in which one note us sung to a syllable, to some of the most elaborate virtuosistic two-part polyphony conceivable (in the Gradual and Alleluia) in which as many as one hundred and twenty notes are given to one syllable. There is even one three-voiced composition in the present Mass, the famous "Congaudeant catholici". known as the first piece of the notated three-part music in Western Europe, and as stunning today as it must have been to the twelfth-century ears. It was not to find a counterpart until the three- and four-voiced compositions of Perotin at Notre Dame of Paris at the end of the century. The Mass exhibits a wealth of forms: rondo, da capo, refrain, double versicle, strophic, through-composed, as well as combinations of these types. Text styles range from Scriptural prose to the later versus, a metrical, rhymed verse form that contrasts vividly with the prose texts, exemplified in the Sequence, as well as many textual and musical additions called tropes. The St. James Mass might as well be termed a study in the art of the trope for it is in these additions to the orthodox ritual that medieval composers were to create their most remarkable achievements, to tall prey, alas, to the reformist zeal of the Council of Trent in the sixteenth century, if indeed they had not fallen out of use prior to that date. These interpolations are distinguished in performance by their soloistic presentation, with the traditional texts being sung, invariably, by the chorus in monophony. Polyphony, which in medieval times was sung soloistically, that is, one person per part, is provides for four items, Kyrie, Gradual, Alleluia, and Benedicamus; these sections add a particular festive flair to the service. The rubrics specify antiphonal performance of the choir in the Prologue; we have also included this style in the Sequence following traditional practice. 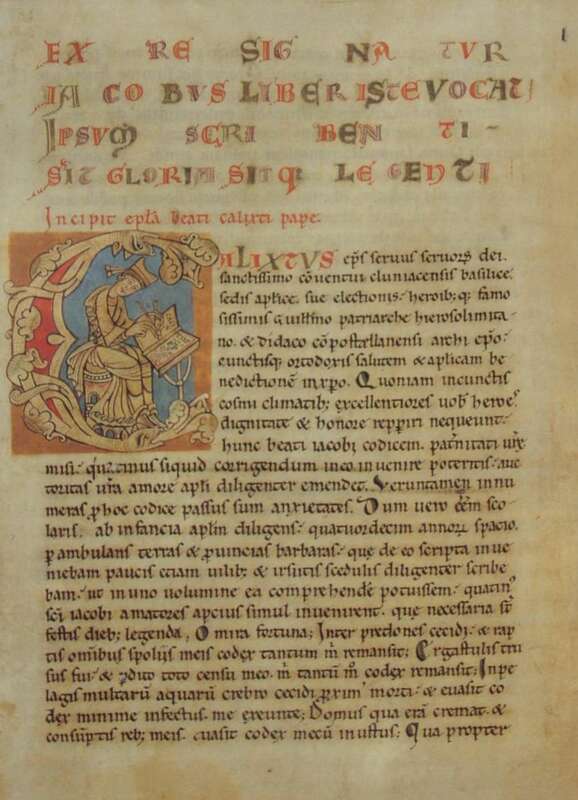 Although the majority of composers of the Mass are anonymous, the source manuscript contains a number of attributions to identifiable twelfth-century persons, most of whom were holders of ecclesiastic office: Hatto, bishop of Troyes (1123-1145), Goslenus, bishop of Soisson (1126-1152), Magister Albertus, archbishop of Bourges (1137-1141), Fulbert, bishop of Chartres (c.960-1028), and the ostensible composer of our Benedicamus, Albertus of Paris (1147-73). The services for the feasts of St. James, including the present Mass, are contained in a remarkable manuscript now housed in the library of the basilica in Santiago, and which I was kindly allowed to consult in preparation for the present recording. The source is the liber sancti Iacobi, otherwise known as the "Codex Calixtinus" in honour of Pope Calixtus II, who undeniably played a major role in the theological justification of the cult of St. James. 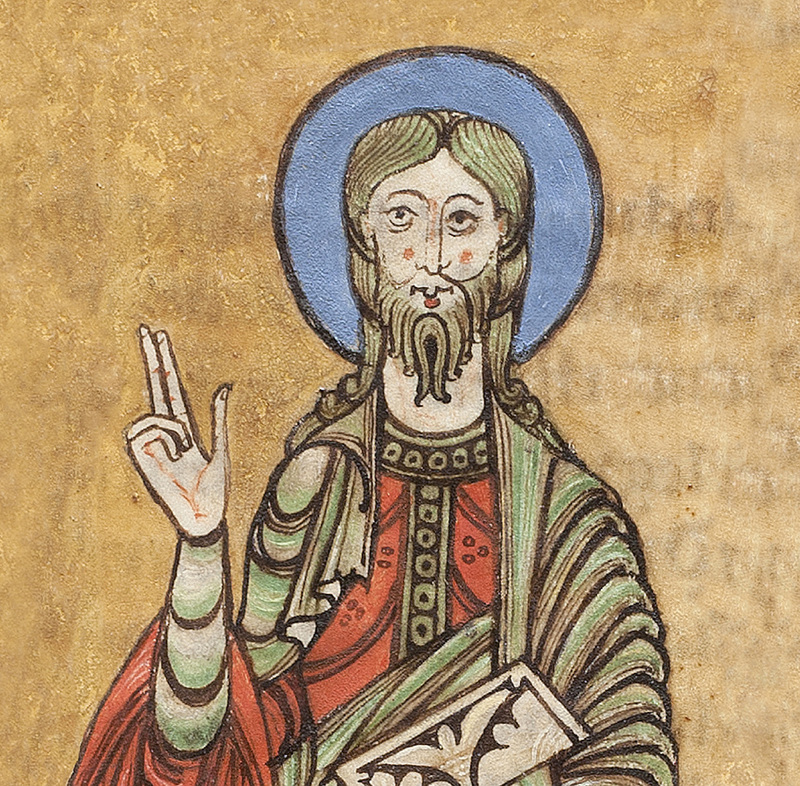 In honour of Calixtus we have chosen as cover art the initial "C" which shows him writing out the manuscript. The codex was compiled around the year 1140 by a group of French and Italian clerics who entered their names at the end of the document. The cathedral itself was nearing completion at that time, with the spectacular west portal to be added later, and the purpose of the manuscript was apparently to give final historical, theological, and liturgical justification to the cult of St. James. The work is a collection of five separate books — liturgical services, a description of St. James miracles, the Translation and Election of James, a twelfth-century pilgrim's guide to Santiago (a sort of medieval Baedeker), and a chronicle of Charlemagne's expedition to Hispania. the liturgical part presents some one hundred services in honour of the patron saint, most of which would have been celebrated during the main feasts days, July 25th to August 1st, but also at those feasts in December, January, and October which had particular relevance to St. James' life and works. Our present recording contains only one of these services! The Latin version of the test follows exactly the source manuscript in respect to spelling, punctuation, and foliation. Rubrics contained in the codex are given here in italics. Additional information not supplied in the manuscript but necessary in the reconstruction appears in parentheses. Troped lines are italicized. We have placed our singers in their presumed twelfth-century locations and have attempted to include the liturgical motion which was so much a part of the 'presentation' of the medieval Mass. In a number of instances, the rubrics in our source give us specific advice, and other information was taken from Joseph Jungmann's The Mass of the Roman Rite. Our Prologue was sung antiphonally as noted in the codex and in procession from back to front. The Introit proper was sung with the choir on the left hand side of the church in the transept, with the cantor soloist situated on the right. Epistle and Gospel were presented from the right and left sides, respectively, and the central axis was reserved for the priest. Our Sequence was performed antiphonally according to medieval traditions: the Coductus follows the rubrics —a "boy processing between two cantors" from the right to the left-hand side and thus introduces the Gospel recitation. For voice ranges we have chosen a choir consisting of four tenors and three baritones. Since the required range for the chorus is just two notes shy of two octaves, it was necessary to include an ensemble with both registers. Our cantors are natural, male tenors, which one presumes was the medieval choice: those sources note the desire for a "round, clear, lively, and manly" (virili) sound from the singers which would seem to preclude the use of countertenors. The manuscript gives a notated range of two octaves plus two notes for the soloists, the highest portions occurring in the Gradual. The scribe uses a rare "g" clef here and asks for a c and octave above middle c. We do not know of any international medieval pitch standard, of course, so we have transposed that item down a third, using modern a'=440. We have used a non-metrical style of performance throughout the Mass and resisted the urge, even in those versus section which might have suggested it, to confine the music into a duple- or tiple-meter straight jacket. Much have been written on the subject of the polyphony of Santiago and its possible influence in later Notre Dame 'school' of Paris with its metricalized clausolae, but it seems unlikely that the music from Compostela exerted any influence on that later repertoire. Notationally, liturgically, and stylistically these sources are quite far apart. The two sections in which a metrical version is unavoidable, the Gloria trope, and the framing portions of the Epistle, however, are performed in an easy-going duple meter. In regard to pronunciation we have assumed that the vernacular in medieval Europe presumable influenced the sounds of the ecclesiastical Latin, but doubt remains as to precisely what inflections were used. In Santiago, a dialect known as "Gallego", a blend of Galician and Portugese was spoken. This dialect contained idiosyncratic sound which, however, have not yet been fully understood. Mr. Arnold Desrochers, a graduate student in Hispanic Studies at McGill University has suggested that the Latin qui and qua were pronounced ki and ka respectively. Also probable is a hard g before a, o and u, as well as a softer g before i and e. The r was probably pronounced flat or slightly flipped. We have restricted the participation of instruments to the use of bells to give initial pitches, being guided by the precise descriptions of the liturgies given in our source codex. Aside from recounting the use of instruments from various countries in the vigil of the saint, none were specified for use during the main services. We are indebted to Prof. Bryan Gilligham of The Institute of Mediaeval Music in Ottawa for his kind permission in allowing us to use the Latin and English texts of the Mass in this present recording.